With more than 130 years of festive tradition behind Groundhog Day in Punxsutawney, Pennsylvania, the eyes of America and beyond tune in every February 2 to witness Punxsutawney Phil, the famed groundhog of long-range weather forecasting lore, see or not see his shadow. The presence of a shadow proclaims six more weeks of winter, while no shadow indicates an early arrival of spring. This year promises high drama as the results could easily swing one way or the other depending on the passing clouds — and there will be clouds. 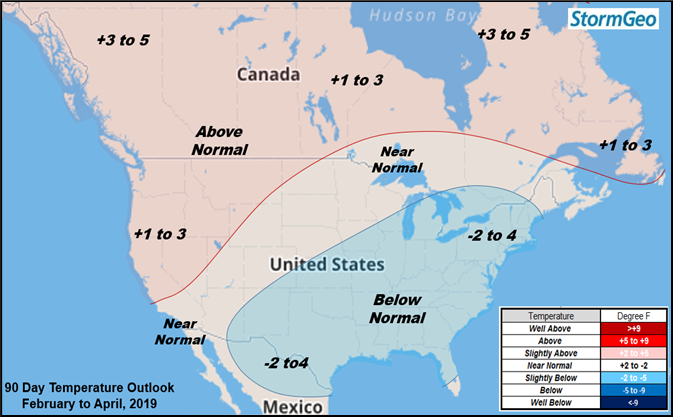 Just like Punxsutawney Phil, Schmude’s talents lie in long-range forecasts, and he predicts that there is quite a bit more winter to go before spring officially arrives on March 20. It was three years ago that Phil last indicated an early spring and only 18 times in the history of Groundhog Day has an early spring been predicted. Though the groundhog’s accuracy is claimed to be 100%, a cloudy morning would certainly help convince even the shrewdest meteorologists. StormGeo’s long-range weather forecasts provide 30-, 90-, and 180-day outlooks to be used in predictive analytics—lending insight, confidence and the freedom to perform while hedging risks and helping to lead to informed decisions. Industry served include manufacturing and supply chain, retail, finance, agriculture and energy trading.